There are many fun Holiday Things To Do In Palm Beach County to enjoy the Holiday Season. With warmer weather, the Holdiays might be a little different in Florida. You can experience a white Christmas, it will just be sand instead of snow. The Christmas season is just around the corner and if you are looking for the best place to experience the holidays, you will definitely want to spend it in Palm Beach County! Witness Sandi, the only 35-foot, 700-ton sand tree in the world as she lights up the venue on November 29 at 7pm. Party to the music of various performers, shop at wonderful gift stores, play Glow FORE It Mini Golf, meet Santa and Mrs. Claus and a lot more! You can enjoy the festive waterfront from November 29 - December 31. It is a fun, free activity. To see all of the special activities check out the Waterfront Fun. Be a part of the 25th Anniversary of Delray Beach's 100 Foot Christmas Tree! Take photos at the Train House or the "Twas the Night Before Christmas" House, the raindeer barn and also get to join Santa's Workshop from Dec. 1 to Jan 1, 10 am to 9 pm daily. Be sure to attend the Tree Lighting that begins on November 29th at 5 pm. Santa will also arrive by Helicopter. 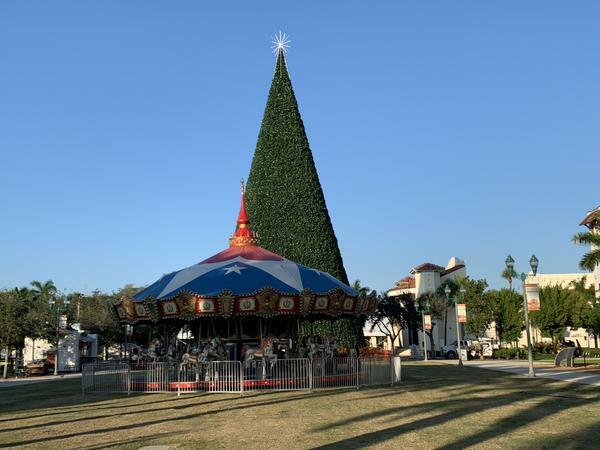 Explore what is going on in Delray Beach at the 100 Foot Christmas Tree. Enjoy different train rides or spend time trying out the delicious food on December 22, at the Mizner Park Amphitheater at 5:30pm. You can also relax in your pajamas and blankets while watching the "Polar Express" movie at 6:30pm. View over 50 decorative boats starting from the Lantana Bridge and stream along the Intracoastal Waterway to the C-15 canal located in Delray. Boat owners are not only competing for recognition but for a good cause for the Toys for Tots Foundation. Bring new and unwrapped toys to share and enjoy the fireworks throughout the whole route. Starting the 6th of December from 5:30 pm to 7:30 pm , visitors can shop for holiday gifts and toys, Christmas decor, books and even jewelry. Sip some wine with family and friends while enjoying treats and special holiday discounts on this benefit event. 6. Who is missing Snow? City Place has Florida's version of a snow fall every night through December 31. There are many fun festive events including music and even an Ugly Sweater Bar Crawl. You can make it a day with shopping, dining and entertainment all in one locaiton. See all of the City Place Fun. Come out and play mini golf with Santa and Mrs Clause on November 23 from 2 - 7 pm. You can enjoy a round of golf, great food and a visit to Santa. It's a perfect day. The season isn't over without welcoming the new year with style! Head down to Lake Victoria Gardens Avenue to enjoy unique artworks and crafts, kiddie carousel rides, artistic face painting, balloon displays and countdown to 2019 with decorative hats and noisemakers! Palm Beach County has too many things to offer for guests and visitors in different cities during this holiday season. From schemed lights, beautiful and unique Christmas Tree displays, decorative boat parades to holiday shopping and other fun-filled activities, Palm Beach County truly knows how to make every holiday season an unforgettable one. Have you ever spent your holidays in Palm Beach County? What were the other fascinating events you witnessed? We would love to hear your stories.